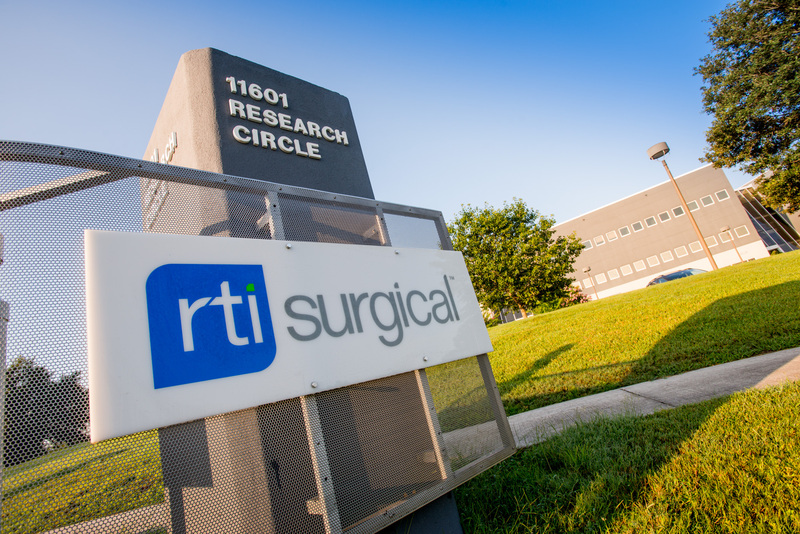 Curt Selquist Elected Chairman, Peter Gearen Elected as Vice Chairman of RTI Surgical's Board - RTI Surgical Holdings, Inc.
ALACHUA, Fla. (Feb. 26, 2016) – RTI Surgical Inc. (RTI) (Nasdaq: RTIX), a global surgical implant company, announced today that its chairman of the board, Dean H. Bergy, has informed the company’s board of directors that he will not stand for re-election at the company’s 2016 annual shareholders’ meeting. He stepped down as chairman effective Feb. 24, 2016; however he will continue to fulfill his role as a board member through the end of his term, which will expire on the date of the 2016 annual shareholders’ meeting. The board named Curtis M. Selquist to succeed Bergy as chairman and named Peter F. Gearen, M.D., as vice chairman effective Feb. 24, 2016. RTI also announced today that the 2016 annual shareholders’ meeting will be scheduled later than the company’s usual April timeframe to allow sufficient time for the nominating and governance committee to follow its thorough process to evaluate the director candidates recently proposed by Krensavage Partners LP, along with other potential candidates. The company said it will announce the date of the shareholders’ meeting and the related record date in due course. Bergy joined RTI’s board in 2010 and became chairman in 2011. He also serves as chairman of the audit committee and as a member of the nominating and governance committee for the company. Selquist, an operating partner with Water Street Healthcare Partners, a strategic investor focused exclusively on the healthcare industry, joined RTI’s board in July 2013. He serves as chairman of RTI’s nominating and governance committee and is a member of the compensation committee. Selquist has invested in and grown a number of healthcare companies at Water Street. Prior to joining Water Street, he achieved a distinguished 35-year career at Johnson & Johnson. Selquist was the company group chairman of Johnson & Johnson Medical and Johnson & Johnson Healthcare Systems. He also served as president of Johnson & Johnson Latin America. Selquist was subsequently appointed worldwide president of Johnson & Johnson - Merck Consumer Pharmaceuticals and company group chairman, responsible for Johnson & Johnson Medical. Selquist was the founding chairman of the Global Healthcare Exchange. He also served as chairman of the National Alliance for Health Information Technology and as a board member of the National Quality Forum, serving as chair of its Leadership Network. Selquist serves as the lead director of Breg, Inc. and as chairman of Temptime Corporation. He received a bachelor’s degree in finance and management from Bradley University. Dr. Gearen has served as a member of RTI’s board of directors since February 1998. He currently serves as chairman of the science and technology committee and is a member of the nominating and governance committee. Dr. Gearen has a depth of medical experience and healthcare knowledge and, as a former practicing orthopedic surgeon, is knowledgeable about RTI products and the orthopedic market in general. Dr. Gearen was chief of staff at Shands Hospital at the University of Florida and served as assistant dean of clinical affairs at the University of Florida College of Medicine from 1992 until 1999. He has been an associate professor at the University of Florida College of Medicine since 1993. Dr. Gearen was appointed chairman of the Department of Orthopedics in May 2002 and stepped down as chairman in June 2010. He retired from practice on June 30, 2012. Dr. Gearen holds a bachelor's degree from Spring Hill College and received his M.D. from the Stritch Loyola Medical School. RTI Surgical will be filing a proxy statement with the SEC in connection with the solicitation of proxies for its 2016 annual meeting of shareholders. Shareholders are strongly advised to read RTI’s 2016 proxy statement and the accompanying WHITE proxy card when they become available because they will contain important information. Shareholders will be able to obtain copies of RTI’s 2016 proxy statement, any amendments or supplements to the proxy statement and other relevant solicitation materials filed by RTI with the SEC in connection with its 2016 annual meeting of shareholders free of charge at the SEC’s website at www.sec.gov, on the company’s website at www.rtix.com, or by writing to our Corporate Secretary at our principal office at 11621 Research Circle, Alachua, Florida 32615. RTI, its directors, and its executive officers may be deemed participants in the solicitation of proxies from shareholders in connection with its 2016 annual meeting of shareholders. Information concerning persons who may be considered participants in the solicitation of RTI's shareholders under the rules of the SEC is set forth in public filings filed by RTI with the SEC and will be set forth in its proxy statement relating to its 2016 annual meeting of shareholders.